Have a transportation-related article you think should be included in headlines? Drop me an email! And don't forget, Metro is on Twitter, Facebook and Instagram. Pick your social media poison! ART OF TRANSIT: I just spent a long weekend in the Eastern Sierra, where leaf peeping is at its peak in many of the canyons. I took the above photo was taken in one of the campgrounds in Lundy Canyon, west of Mono Lake. 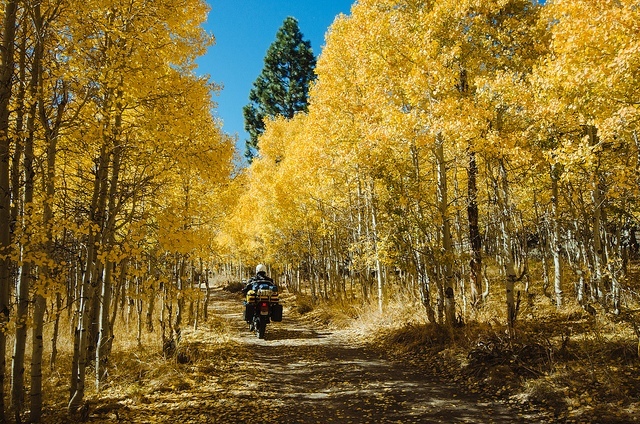 Luck was on my side: I was just trying to snap a shot of the aspens when a dude rode through on a motorcycle, thereby adding some interestingness to the photo. For those wondering about the government shutdown’s impact on your public lands: As far as I could tell, all the national forest service trails and parking lots in the Mammoth Lakes area were open; on the visitor centers and ranger stations were closed. Tioga Road through Yosemite National is open, but the National Park Service was telling the media that people who stop along the road would be cited. I wanted to test that, but ended up hiking closer to Mammoth. Editor Damien Newton tackles the Metro project to build a bridge over Lankershim Boulevard adjacent to the Universal City Red Line station. The now $27-million project strikes Damien as money not well spent and he would like to see the new mayor — a member of the Metro Board — do something about this and other projects that, in Damien’s view, would not serve pedestrians or cyclists. Read the comments for a counterpoint of sorts. In a new tactic in their ongoing fight against the state bullet train project, Kings County Board of Supervisors indicated they may challenge the project’s environmental studies. An attorney hired by the Board recently indicated the Board is saying the study didn’t adequately study flooding and seismic issues for the chosen route between Fresno and Bakersfield. About $77,000 is needed to help complete the funding picture for the $4.5-million project. It’s believed to be the first time that asking the public to directly contribute to a transportation project has been done. Lawyers who read this blog: is that something that is legal in California? And all readers: is that a possible way to help build transportation projects in LaLA Land? I’m out of town for a few days and miss great stories such as this one from New York. As the responsible government mouthpiece that I am, I must remind everyone that chowing down on anything on Metro trains and buses — including cheese and crackers — is a violation of about 15 different rules and can result in a big fine. In any event, gruyere is much better than brie.